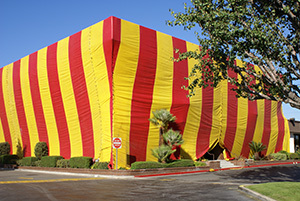 Fumigation is the most common method for treating termites in Los Angeles, California. While it is typically effective, it does come with drawbacks. Tenting your home is a major disruption to your lifestyle and forces you to spend additional money on accommodations until treatment is complete. You’ll also need to ensure all of your medications and food are completely sealed to avoid contamination. What’s more, fumigation is not always effective against subterranean termites, as they can simply burrow into the ground and return later. Fortunately, there’s an alternative to fumigation that is far more convenient. Kilter Termite and Pest Control uses the KILGUARD system, which does not require tenting. Instead, it targets termite infestations exactly where they are. Not only is this method proven effective at eliminating both drywood and subterranean termites, it won’t disrupt your home life. Because there are no noxious odors or fumes involved, you’ll be able to stay home throughout the process without having to worry about tainted food or medications. What’s more, upon completion of the project, we’ll provide you with a two-year warranty, so you can be sure termites won’t soon return to your home. If you’d like to learn more about the advantages of our termite treatment system over fumigation, contact us today. We’ll be happy to schedule a free, no-obligation termite inspection at your Los Angeles area home, so you can get an honest and accurate assessment.